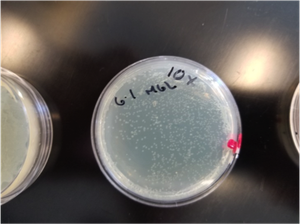 This protocol describes methodology for plating antibiotic over-agar for the selection of E. coli. 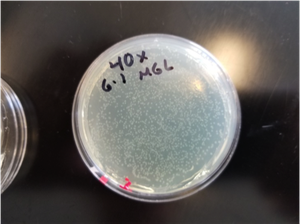 Over-agar spreading of antibiotic makes it easy for an investigator to conveniently plate and select transformed cells containing plasmids differing in their resistance genes, as one does not need to prepare separate batches of antibiotic-containing agar. This protocol will focus specifically on selection with carbenicillin; however it can be adapted for any antibiotic through the use of a selection curve to determine optimal antibiotic concentration. Prepare carbenicillin to a concentration of 1 mg/mL – 4 mg/mL in LB medium. The concentration of antibiotic required for effective over-agar selection has been empirically determined to be higher than that required for selection with antibiotic in-agar (100 µg/mL). See selection curve below. Carbenicillin is used here in place of ampicillin because carbenicillin is more stable, so it is potentially more effective at selecting only bacteria containing the plasmids of interest (for example, fewer satellite colonies will grow). It is, however, more expensive. 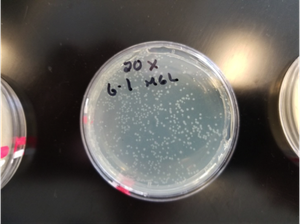 With a 6 cm2 petri plate containing solidified LB-agar, pipette 150 µL of carbenicillin on top of the agar and gently spread over the surface until the liquid is mostly absorbed (there is a very small visible volume of pooled liquid remaining on the surface). We use the micropipette tip itself to do the spreading; the tip is gently bent to create an “L” shape, and then used like a cell spreader. Several other devices may be used for this purpose, provided that they fit your petri plate. Incubate the plate at room temperature for at least 30 minutes with the lid on to give the antibiotic time to more fully absorb. Plate 50 µL of transformed E. coli/rescue media suspension onto the agar and gently spread over the surface until the liquid is mostly absorbed. The spreading of cells can be done in the same way as the antibiotic, using either a bent micropipette tip or other cell spreading device that fits the plate. Incubate plates at 37 ℃ for 18 hours. Observe plates for colony formation. 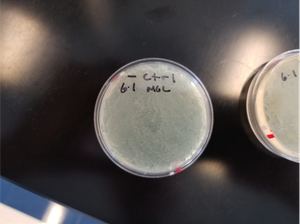 Shown below are the results from an experiment optimizing the concentration of carbenicillin, plated over-agar for selection of transformed E. coli. 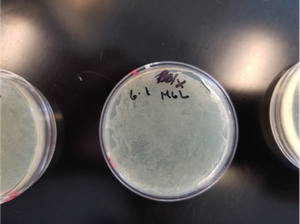 Selection of E.coli on LB-agar using different concentrations of carbenicillin plated over-agar. Plate shows a lawn of E. coli and no selection. Plate shows a lawn of E. coli and no apparent selection. Plate shows several individual colonies and effective selection. Plate shows less individual colonies than the 1 mg/mL plate and effective selection. Plate shows several individual colonies with smaller size than the 1 mg/mL and 2 mg/mL plates and effective selection. 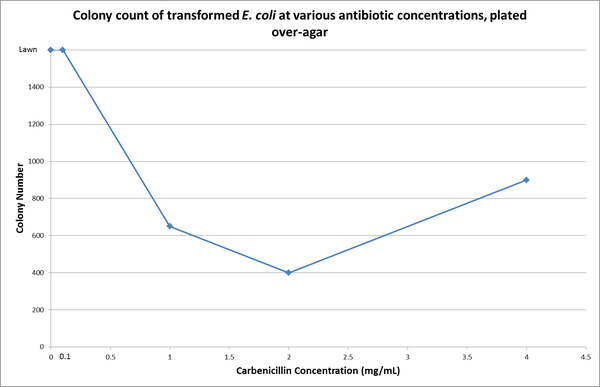 Selection Curve of Transformed E. coli after Over-Agar Plating of Carbenicillin. The effective concentration of carbenicillin that generated single colonies is between 1 mg/mL and 4 mg/mL. Please note we have found that there is generally a broad range of antibiotic concentrations that will work for this assay, and the above result represents a single experiment. For publishable data, the experiment would need to be repeated to account for variability.